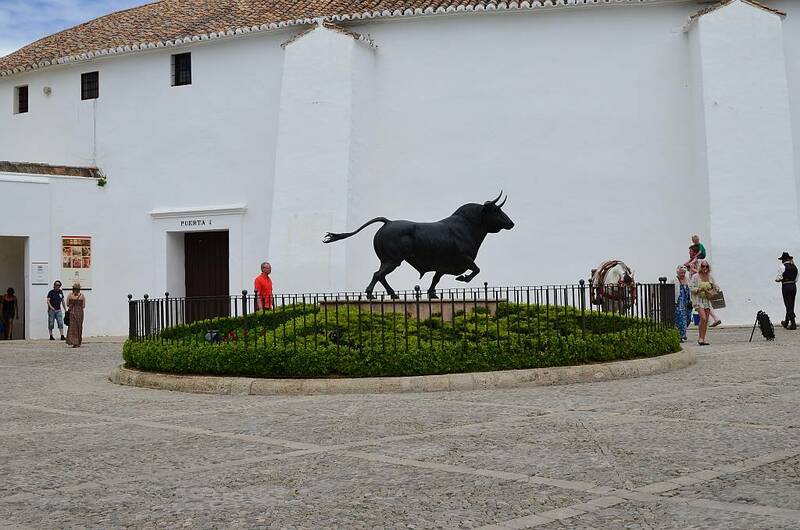 Ronda is about 2.5 hours drive from Nerja. The road winds up through the Sierra Bermeja mountains and the views are fantastic. 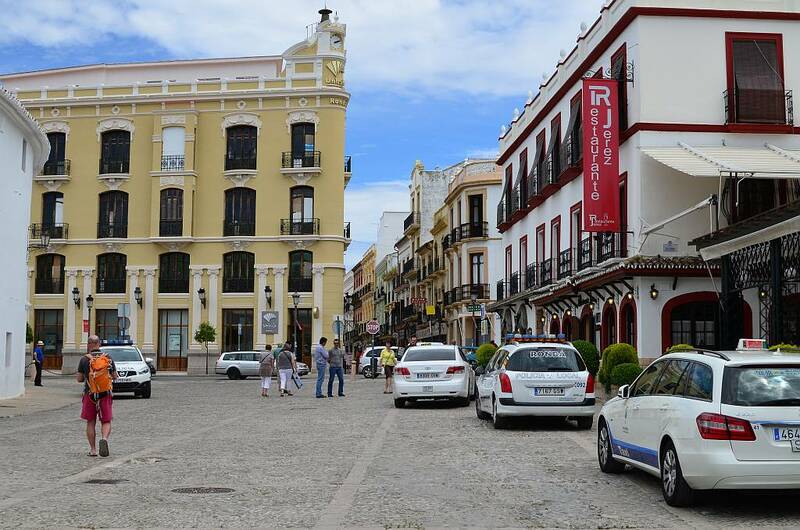 An alternative to driving is a new daily train service from Málaga (Maria Zambrano station) to Ronda. 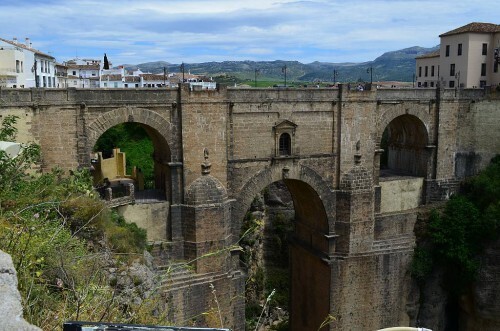 The train leaves Málaga Maria Zambrano station at 10:05 and arrives in Ronda at 11:56. The return journey is at 16:50, arriving back in Málaga at 18:50. That gives you nearly five hours to look around, although you could always stay overnight to give you more time. 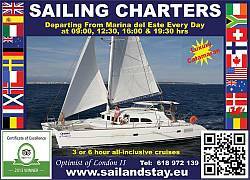 The cost (May 2014) is €14.25 each way and it is bookable online, although getting to the right place on the RENFE website could be easier. What you need to do to check times/prices/book etc is as follows: Access the RENFE website and instead of selecting station of origin and destination in the boxes provided (Ronda is not listed), go to 'Ver todas las estaciones'. A full alphabetical list of stations will appear. Fill in the day, month and year of travel and then first station you select is origin (Malaga Maria Zambrano) and the second is destination (Ronda). The relevant schedule information appears and from here you can change dates, reverse the route etc. The discount for children aged 4 to 13 years is 40%, children under 4 years travel free but cannot occupy a seat. See Bus Timetables or Alsa to check when you would have to leave Nerja for Málaga in order to catch the train. This was the main entrance to the city and was once protected by towers. Entry to the area is through the horseshoe-shaped Moorish Gate, Puerta de Almocábar. On the corner of this gate, the Almohad rulers erected an octagonal tower, destroyed by the Christians during their successful assault in 1485, and this spot is now marked by the Iglesia del Espiritu Santo, a church built by the victorious Christians to celebrate their victory on Whit Sunday, May 20th 1485. To the west is the other surviving horseshoe-shaped arch, the Arco de Cristo. There is also an old Moorish minaret, renamed the Minaret of San Sebastián by the Christians. The old city walls still stand and visitors can walk along them towards the bridge. Below, in a walled garden, is the well Moorish bath house, the Hammam. It is open to the public , free of charge, though not for bathing. Many of the old Moorish style buildings and small palaces survive and many are open to the public. River gorge dividing the medieval and 18th Century parts of town. The bridge, started in 1751 and taking 42 years to complete, stands at height of 300 feet and was designed by architect José Martin de Aldehuela. Huge stone blocks had to be raised from the bottom of the gorge and this was an engineering feat in itself. This was not the first bridge on this site. 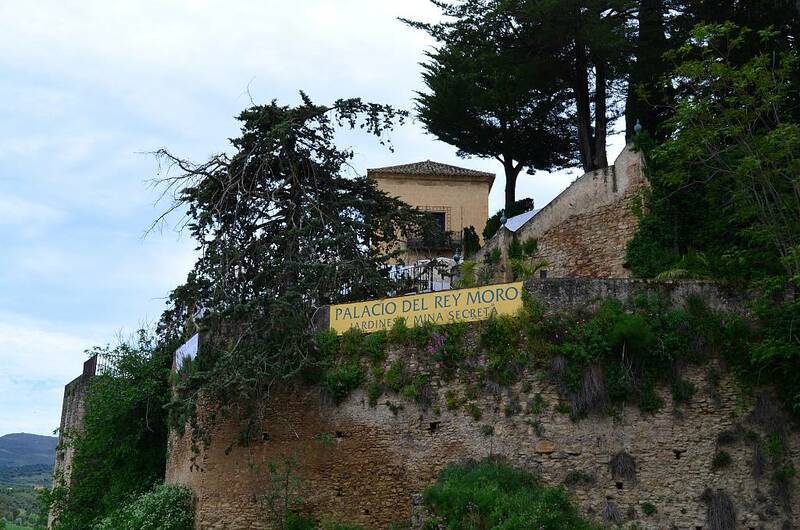 Records show that in the early 1730s, one was completed in just eight months by Juan Camacho and José Garcia. However, such was the perilous nature of their construction, it collapsed with the loss of some fifty lives. Beneath the central arch is a chamber which was used, at one time, as a prison. It is entered via a square building which was once the guard-house. For a fee, visitors can enter the chamber and see an exhibition describing the bridge's history and construction. Built in the 18th Century with gardens designed by the French landscape gardener Forestier in 1912, it houses the so-called Water Mine. 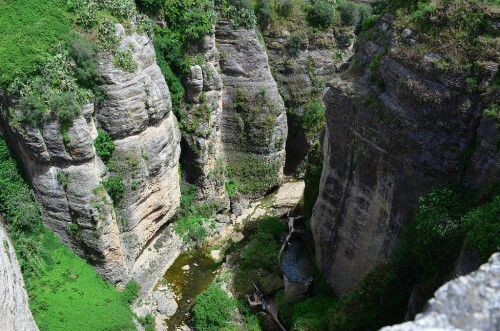 In the 14th Century, Ronda was frequently besieged and the Moorish king, Abomelik, ordered the cutting of steps into the stone walls of the gorge to enable the bringing of water from the Río Guadelevin below. The crumbling staircase was restored in 1911. The steps pass through a number of chambers including the Sala de Secretos (Room of Secrets). Originally designed to house a well, the Moors supposedly noticed that the room had one special characteristic. Two people standing close to the wall, but at opposite ends of the room, could speak perfectly well to each other without being audible to anyone standing in the middle of it. The steps eventually lead the bottom of the gorge. It is quite a haul and bear in mind that the only way out is back up the 300 steps!! Museum devoted to the history of the area. Stone structure completed in 1784 and Spain's oldest existing bullring. Tree-lined avenue opened to the public in 1806. Up the hill from the bullring is a flight of stone steps leading to the wooden doors of the Merced Carmelite Convent. The first Carmelites were male hermits, former pilgrims and crusaders who gathered together in 1155 AD at Mount Carmel in Palestine and dedicated themselves to a life of austerity, poverty and prayer. There were also women who wanted a similar life and in 1452 John Soreth, Prior General of the Carmelites, officially affiliated the first nuns. The sisters in the convent , established in the 16th Century, belong to the Mercedarian order. It is a cloistered order devoted to prayer, penance and perpetual abstinence. Visitors are always welcome but the nuns' privacy must be respected at all times.